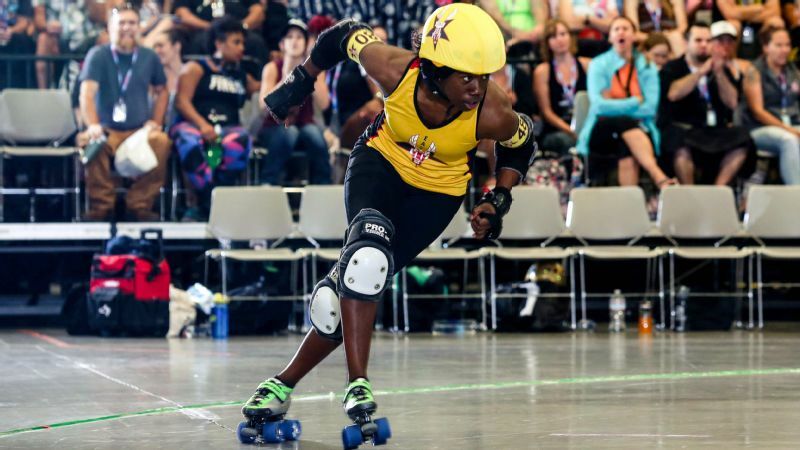 Jacksonville star jammer Erin Jackson has a huge collection of medals at home. Funny thing is, they're not for roller derby. First as a Florida rink rat dabbling in figure skating, Erin Jackson has been on the move since she was a kid. As a teen, Jackson took up competitive inline speedskating. Before finishing high school, she had won five inline speedskating medals at the 2008-09 junior world championships, including gold in the 500-meter race. Jackson kept on rolling upon enrolling at the University of Florida as an engineering student. After winning four medals at the adult-level world championships, Jackson was named United States Olympic Committee Female Athlete of the Year for Roller Sports in 2012 and 2013 -- all while maintaining a spot on the university's dean's list. As if that weren't enough, in October of 2012 Jackson decided to give quad skates a shot, joining the Jacksonville RollerGirls. 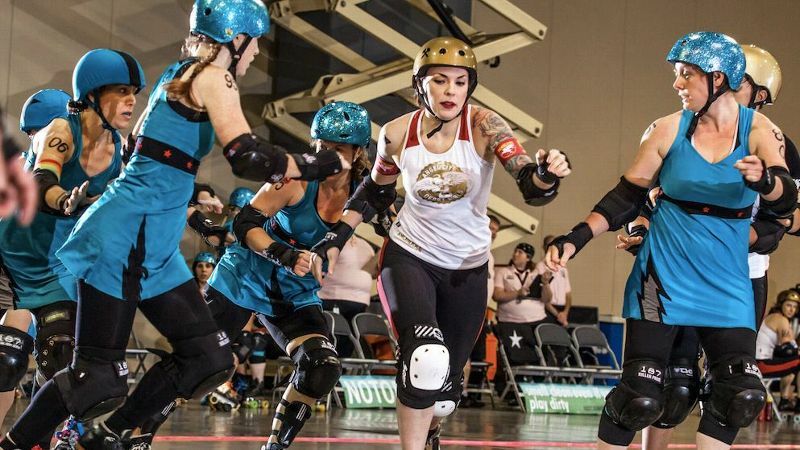 Translating her speed and agility into becoming a dangerous roller derby jammer, Jackson helped Jacksonville win nine of its 10 regular-season games this year and shoot up to No. 8 in the Women's Flat Track Derby Association international rankings. Jacksonville then beat longtime powerhouse Denver 193-163 in a September playoff matchup. And now the 23-year-old Jackson will lead this once relatively unknown team in its debut in the WFTDA championship tournament. 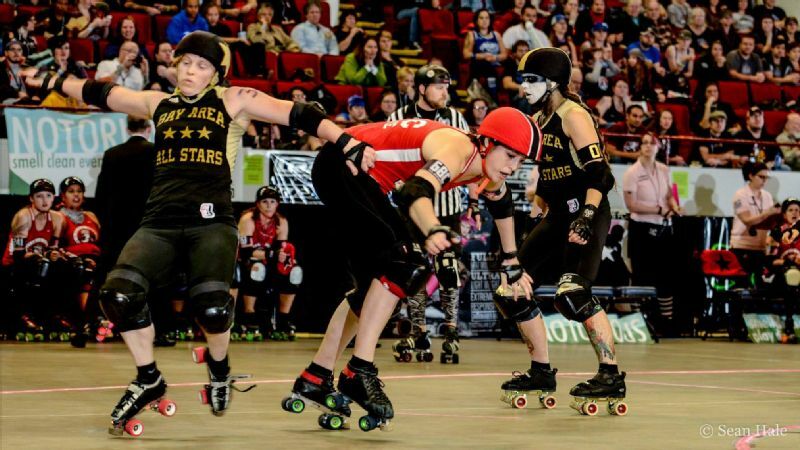 The 10th annual WFTDA championships start Friday in St. Paul, Minnesota, and it will feature the world's top 12 teams, all battling for the coveted Hydra Trophy. The final day of "Champs" will be broadcast live Sunday on ESPN3. 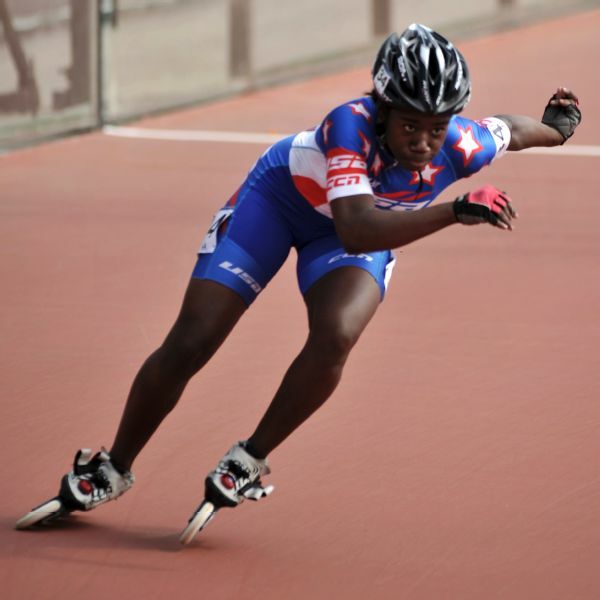 Splitting her time among inline speedskating, college and playing roller derby wasn't originally in Jackson's plans. But she said that after she saw derby for the first time a few years ago, the hard-hitting sport quietly began calling her name. "I felt like both lanes were open," she said. "I had been speedskating for a long time and just wanted to make time for it. [Roller derby] had been in my mind for about six years. "Now I'm always trying to talk speedskating friends into trying it." Jackson is one in an increasingly long line of elite athletes from other sports to be lured to the flat track. In 2009, Julie Brandt-Glass, a decorated inline speed skater and X Games gold medalist, joined the Oly Rollers of Olympia, Washington. Brandt-Glass, who would play derby under the name "Atomatrix," helped the Oly Rollers run the table that year, going undefeated before winning the 2009 WFTDA Championship in Philadelphia. Like Brandt-Glass, Sandrine Rangeon, who played both ice hockey and roller hockey for Team France from age 16, ditched her decade-long digs in hockey altogether and helped lift Denver Roller Derby to third place at the 2011 WFTDA Championship. Rangeon won the tournament's Most Valuable Jammer accolade. Perhaps what makes Jackson different, though, is her dedication to roller derby while still excelling in inline speedskating at the highest level. At the 2014 Pan American Championships, Jackson won a gold medal in the 500 meters and won a gold (500 meters) and silver (200 meters) at the 2014 Pan American Olympic Festival. Most recently she also won a silver medal in July's Pan American Games, in the 500 meters. Yet, alongside her participation with the Ocala Speed Inline Racing Team, Jackson still makes time for up to four practices a week for roller derby. 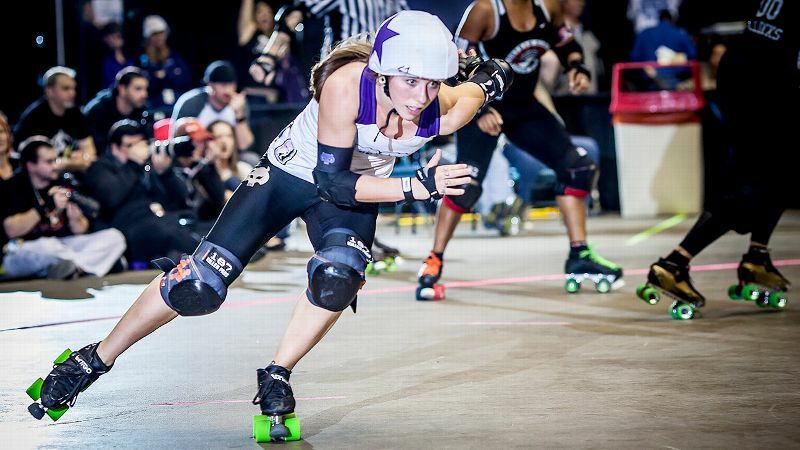 "She's not what I would consider a flashy skater, jumping the apex at every chance," said Stacie Wilhelm of Denver. "But she's one of the best because of her ability to see holes and exploit them. In the world of roller derby, that's what's successful." And despite Jackson's achievements and newfound stardom as one of derby's fastest jammers, Wilhelm admires more than the slick moves. Erin Jackson has been an inline star since her teens. "It's easy for athletes who gain attention because of their skills to allow their egos to grow," Wilhelm said. "Erin is not at all one of those people. She's just an all-around kind person, which makes me respect her that much more." Jackson's teammates agree. Takia Agresta, who also skates as a jammer with Jacksonville, can speak to both Jackson's skill and her team dedication. "Off the line, Erin has amazing power, and if you give her an inch in the pack she's gone." Agresta said. "But even though she is essentially an Olympic athlete, she is just one of us. She comes to practice, listens to coaches and is humble about her accomplishments." Jackson herself underscores that derby is a team sport, and only as a team can you get to the championship tournament. "The real changes we've made as a team are in the defense," Jackson said. "Our blockers are a key to our wins, opening holes for our jammers to get through to score points." Friday evening Jacksonville has a first-round matchup against the Arch Rival Rollergirls from St. Louis, whom they beat 193-112 in August. If Jacksonville wins its first bout, it will face five-time world champion Gotham Girls Roller Derby, from New York City. Gotham, the reigning champ, has not lost a sanctioned flat-track bout since 2010. "We're definitely hoping to make it into that second round. And if we have a good game against Arch, we get the No. 1 team," Jackson said. "We're going to come in guns blazing to get everyone off their game. That's the plan with each game we play."